This is Down On The Street Bonus Edition, where we check out interesting street-parked cars located in places other than the Island That Rust Forgot. You never know what you'll find in Copenhagen! Encouraging to see both the International & the SAAB and the stuff I wrote on Jalopnik, so here's some more. I thought of sending pics of an Amazon as well, to complement the story below, but they appear on Jalopnik often enough. In the mid-1960's the Danish police force used the Ford Zodiac's downscale sibling, the Zephyr. The latter shared the wide body of the former, which was taken advantage of by the so-called 'Volvo Robber', who more often than not would use a stolen Volvo Amazon as the getaway car after break-ins and bank robberies. Once he carefully planned his escape route through a tight spot where a Zephyr was just a bit too wide, and thus manged to evade The Law. He was hardly a Robin Hood type, but the press as well as the public loved the story. This Zodiac is literally the first I've seen on the street for 30+ years. 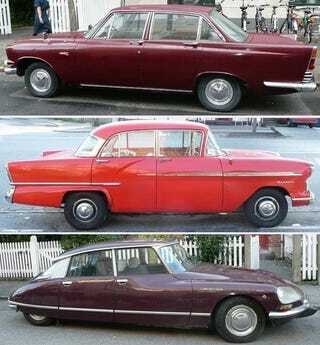 That goes for the Vauxhall Victor too. Note the cross stitch pillow in the rear window - a common home-made accessory of the early 60's. The Citroên is not as rare a beast, because the few that didn't rust away before mandatory bi-annual inspections were introduced ten years ago, are usually well kept and keep their value. One could reasonably argue that this was the last beautiful Citroên design.